The Brit Awards Critics’ Choice artist James Bay is a 24-year-old British singer-songwriter who has thus far released a number of EPs and an acclaimed debut album, Chaos and the Calm (2015) that achieved the distinction of topping the UK charts and reaching #15 in the United States. Blessed with a rasping blues voice and instantly catchy radio-friendly songs he has been closely followed and supported by local media in the UK who picked up on his track “Let It Go”, a song that won him many fans on the influential station Radio 1. A fine live performer to boot his stage highlights already include support slots with Kodaline and Tom Odell and he was a festival sensation at 2014’s T in the Park and V, where his stunning combination of soothing sentiments allied to a darker inner emotional impact made a steady connection to the mainstream while winning him a bunch of fans. Great songs and lyrics aside James is a fine acoustic guitarist whose soulful blues style and undeniable good looks have obvious appeal. He also has a trademark image – all cheekbones, wide brimmed hat and long dark hair – and a flexible range that includes some falsetto notes reminiscent of Sam Smith, though with an edge that recalls Marcus Mumford and Odell. A traditional songwriter who likes to incorporate arrangements based around strings and piano James also has an earthy countrified twang that when mixed into his own indie pop grooves provides a most satisfying listening experience. James Bay was born in the English town of Hitchin in the county of Hertfordshire in 1990. At home he learnt to play guitar having been inspired by Eric Clapton’s style on the song “Layla”. Luckily there were acoustic instruments in the family home to set him loose and a diligent study of other artists via YouTube fired his imagination still further. Aged 18 James moved to Brighton to study at the Brighton Institute of Modern Music, one of six independent colleges in the UK and the Republic of Ireland that specialise in education with the emphasis on musical theory, production, the business in general and a grounding in the practicalities of taking up a career in the competitive world of modern sound. The Brighton arm of the British and Irish Modern Music Institute was founded in 2001 with Bruce Dickinson of Iron Maiden being amongst the sponsors. Having cut his teeth in college James set out to test the waters at Brighton’s many open mic nights. This brought him to the attention of Republic Records and within a week he was signed to the label and ready to create his first EP, The Dark of the Morning in 2013. By early 2014 he was up and running and headlining his own sell-out UK tour. Bay’s second EP, Let It Go, spawned the single of the same name, a co-write between the artist and the noted British songwriter and musician Paul Barry (who also co-wrote Cher’s “Believe” and Enrique Iglesias’ “Ballamos”). The track did sufficiently well to crack open charts worldwide, being especially popular in Australia and the US where it made a healthy inroad into the Adult Alternative Songs (Billboard) list. Another excellent song here is “Heavy Handed”, penned by Bay and songwriter Ed Harcourt. The next release would be the EP Hold Back the River (2014) where James continues to flourish with producer Jacquire King (Kings of Leon, Tom Waits, Modest Mouse et al). This EP makes #2 on the Digital Download charts and establishes James once and for all. Not only that but the sales prove noteworthy with Platinum status in the UK, Italy, New Zealand and Australia. 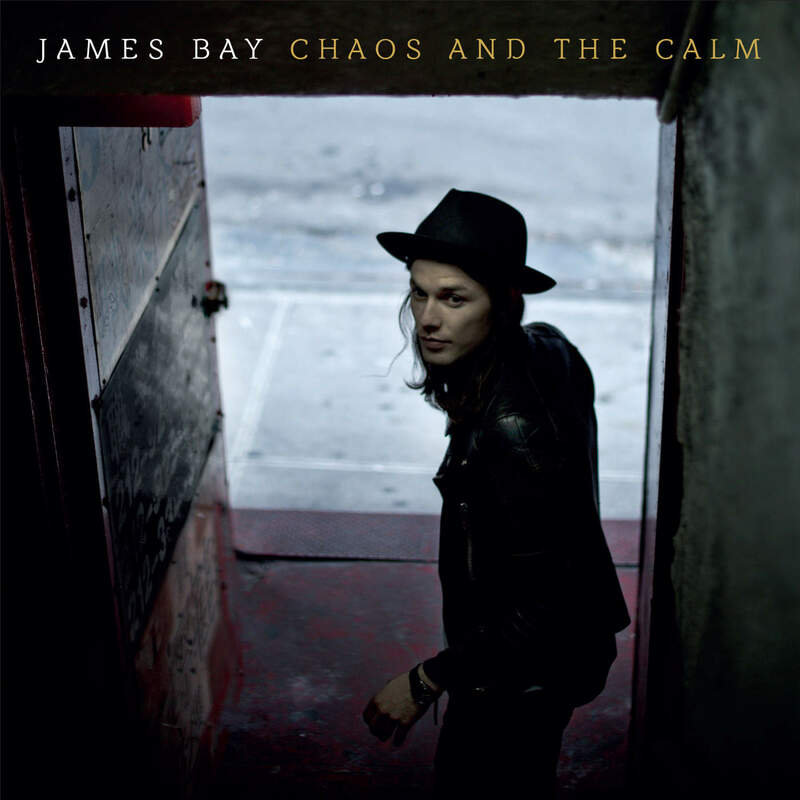 So to the main event of 2105, James’ folk rock and soul debut album, Chaos and the Calm. Including some of his earlier EP material, it also has a collaboration with former Snow Patrol man Iain Archer on the opening cut “Craving”. Amazingly for an artist who was hitherto relatively unknown outside his fan base the album went straight to number one and sold over 60,000 on its first week alone. It has since gone Gold and continues to download like hotcakes. It has also featured in five different US chart strands, including Folk and Top Alternative, ensuring a wide listenership. Bay’s solo composition “Scars” went viral and hooked James into a dedicated and young group of artists who appeal to their own age group. We recommend the Deluxe version where bonus tracks feature the gorgeous “Running” and “Clocks Go Forward”, the darker ”Stealing Cars” and a live at the iTunes Festival version of “Scars”. Add this to the Other Side EP for an enjoyable crash course into this singular young man and you’ll find yourself joining his army of Twitter followers. Very much a talent rooted in the here and now James Bay is evidently someone to watch in the future. We’re extremely excited about him. If you haven’t discovered him yet then grab some of his chaos and calm for yourself and maybe catch James in his own environment during this summer’s festival circuit, including appearances in Manchester, Nottingham and the Isle of Wight in June and in Scotland at Strathallan Castle in July. Chances are you will be delighted that you did. James Bay is a young British singer and songwriter whose heartfelt songs and passionate vocal style suggest a greater maturity and experience than one would expect from an artist whose debut album was released when he was 24 years old. Chaos and the Calm, Bay's first full-length album following a pair of well-received EPs, reveals he has a precocious talent as a songwriter, guitarist, and vocalist, and is just as comfortable with outgoing tracks like "Collide" as he is with intimate, personal numbers such as "Let It Go" as he winds together elements of pop, folk, rock, blues, and soul. Often compared to Ed Sheeran and Ben Howard, Chaos and the Calm shows James Bay has the style and the ability to stand on his own, and it's the work of a new performer with an impressive potential.